Orion was the son of Neptune. He was a handsome giant and a mighty hunter. His father gave him the power of wading through the depths of the sea, or as others say, of walking on its surface. Orion loved Merope, the daughter of Oenopion, king of Chios, and sought her in marriage. He cleared the island of wild beasts, and brought the spoils of the chase as presents to his beloved; but as Oenopion constantly deferred his consent, Orion attempted to gain possession of the maiden by violence. Her father, incensed at this conduct, having made Orion drunk, deprived him of his sight, and cast him out on the sea shore. The blinded hero followed the sound of the Cyclops' hammer till he reached Lemnos, and came to the forge of Vulcan, who, taking pity on him, gave him Kedalion, one of his men, to be his guide to the abode of the sun. Placing Kedalion on his shoulders, Orion proceeded to the east, and there meeting the sun-god, was restored to sight by his beam. After this he dwelt as a hunter with Diana, with whom he was a favorite, and it is even said she was about to marry him. Her brother was highly displeased and often chide her, but to no purpose. One day, observing Orion wading though the sea with his head just above the water, Apollo pointed it out to his sister and maintained that she could not hit that black thing on the sea. The archer-goddess discharged a shaft with fatal aim. 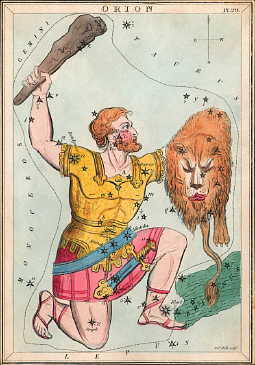 The waves rolled the dead body of Orion to the land, and bewailing her fatal error with many tears, Diana placed him among the stars, where he appears as a giant, with a girdle, sword, lion's skin, and club. Sirius, his dog, follows him, and the Pleiads fly before him. The Pleiads were daughters of Atlas, and nymphs of Diana's train. One day Orion saw them, and became enamored, and pursued them. In their distress they prayed to the gods to change their form, and Jupiter in pity turned them into pigeons, and then made them a constellation in the sky. Though their numbers was seven, only six stars are visible, for Electra, one of them, it is said, left her place that she might not behold the ruin of Troy, for that city was founded by her son Dardanus. The sight had such an effect on her sisters that they have looked pale ever since. "Down fell the red skin of the lion Into the river at his feet. His mighty club no longer beat The forehead of the bull; but he Reeled as of yore beside the sea, When blinded by Oenopion He sought the blacksmith at his forge, And climbing up the narrow gorge, Fixed his blank eyes upon the sun."